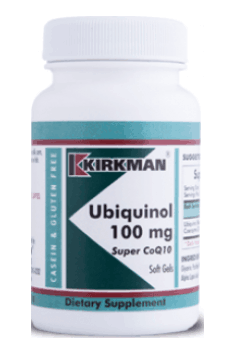 Kirkman Ubiquinol Super CoQ10 is a dietary supplement in the composition of which there is a reduced, bioactive form of coenzyme Q10, i.e. ubiquinol. It is characterized by the highest possible bioavailability and works like a universal antioxidant in the organism. Moreover, it has cardioprotective and rejuvenating properties. The preparation is especially recommended to middle-aged people and seniors. It may improve their comfort of life by increasing energy level and life vitality and slowing down aging processes of the organism. It also constitutes a well-tried element of prophylaxis of civilization diseases, especially those related to the cardiovascular system. Coenzyme Q10 facilitates the improvement of organism’s efficiency, reduces fatigue and stimulates regeneration, therefore it may bring benefits also to younger people, especially those physically active and living in a fast pace. Ubiquinol is a biologically active form of coenzyme Q10. Coenzyme Q10 is an organic chemical compound, which occurs in two forms: oxidized (ubiquinone) and reduced (ubiquinol). It is estimated that the reduced form of coenzyme Q10 is 8 times better-absorbable in the bloodstream, inhibits aging of the organism 40 times more effectively and is ca. 90% more effective in inhibiting fatigue. Ubiquinol is responsible in the organism for energy changes, takes part in protecting cells from oxidative damage and influence a range of parameters, which condition proper work of heart and the whole cardiovascular system. One of the most important roles fulfilled by coenzyme Q10 is its antioxidant function. In this area, ubiquinol definitely stands out, as it exhibits direct antioxidant effect. By giving away an hydrogen atom, it creates ubisemiquinone radical, which may react with molecular oxygen and other free radicals. Moreover, coenzyme Q10 strengthens the effect of another strong antioxidant, vitamin E. It restores its antioxidant potential, lost in the reactions with free radicals. While the effect of coenzyme Q10 is not conditioned by the presence of vitamin E, the full activity of vitamin E is dependent on the availability of coenzyme Q10. In this way, coenzyme Q10 is one of the most important elements of antioxidant barrier of the organism. Coenzyme Q10 is an important regulator of energy transformations taking place in mitochondria. It takes part in converting carbohydrates and fatty acids into lifegiving energy. In the presence of coenzyme Q10, adenosine triphosphate (ATP) is produced, which is used by all cells of the organism. Coenzyme Q10 deficiencies negatively influence mitochondrial metabolism and ATP production. Cells devoid of their basic energy source work less efficiently, which may be felt as worse physical efficiency, fatigue and general loss of powers. The organ, which to a largest extent takes advantage of the beneficial effect of coenzyme Q10 is heart. It was proven in clinical studies that coenzyme Q10 may be utilized as an effective element of the therapy of cardiomyopathies of various kinds. Coenzyme Q10 not only improves the efficiency of the heart muscle, but it also influences the factors, which increase the risk of cardiovascular system disorders. It prevents the creation of atherosclerotic plaques, helps to reduce increased blood pressure and limits aggregation of platelets. Supplementing the level of coenzyme Q10 is recommended especially to people who in the treatment of hypercholesterolemia and prevention of strokes use reductase inhibitors HMG-CoA (commonly known as statins). An incredibly common side-effect of statins is myopathy, i.e. the disorders of muscle cell work, which give symptoms of weakness and loss of strength. Researchers discovered that statins cause rapid reduction of the level of endogenous coenzyme Q10. Supplementing its systemic supplies in many cases contributes to reducing the symptoms of myopathy. Coenzyme Q10 directly affects cell membranes – improves their integrity and regulates biochemical properties. It makes them more resistant to the negative influence of various factors. Thanks to its interaction with membrane proteins, it provides membranes with proper nourishment and secures them from the loss of substances necessary for their proper functioning. Summing up, Ubiquinol Super CoQ10 is a supplement recommended both in prophylaxis and therapy of the diseases of heart and cardiovascular system. It may be used by adults, who want to increase their energy supplies, slow down aging and improve the comfort of life. Both the dose and form of the active substance were selected in such a way, as to support the organism as effectively as possible. Preventively, it is recommended to take 1 capsule a day. It was proven in the research that optimal benefits (especially if the supplementation is applied in order to support the treatment, not prophylaxis) may be achieved at the doses of 400 mg per day. Coenzyme Q10 belongs to the group of compounds soluble in fats, therefore in order to ensure optimal absorption and bioavailability, it is worth taking it during a meal containing a source of fat. Kirkman is the quality leader in the nutraceutical industry. Products by KIRKMAN stand out because of the strictest purity control on the dietary supplement market, thanks to which they can be used by people with special requirements and food sensitivities. Products by Kirkman comply with the highest standard of purity tests (the Ultra Tested® protocol) in terms of the content of over 950 (!) contaminants originating from the environment, including: 24 heavy metals, common allergens, PCBs, artificial flavours/colourants, bacteria, moulds, yeasts, pesticides, and substances that distort hormone economy in the organism. It is of great importance not only for people struggling with an allergy or a food intolerance, but also for the health of children – it has been demonstrated that using pesticides can be closely linked with the development of neurological disorders especially in that group. D-Limonene Oil, Gelatin, Glycerin, Purified Water, Caprylic Acid, Capric Acid, Caramel Liquid, Alpha Lipoic Acid.